I love the look of backless choli and halter tops, but unfortunately as a 36D, I cannot imagine dancing comfortably without support. Is there a way to add bra cups to a backless choli top? Do you have any alternative ideas? This craze for the backless choli has caused no end of headaches. Most women with B or C-cup and larger bust prefer not to dance without a bra, nor is it flattering for most. The breasts will be bouncing, and this is distracting for the audience, as well as uncomfortable for the dancer. Those with an A-cup bust might be comfortable, but will appear completely flat-chested - which is fine for some. The East Indian choli more often than not does have a back, so there is no traditional reason to wear a backless one, that I know of. A choli with a wide, deep back neckline, in a scooped, square, or V shape, still shows a lot of back, and will cover a bra underneath, as in the photo. If it tends to slip off the shoulder, add ribbon ties to the back neck, just as with a backless style, to avoid that problem. Bra cups can be sewn inside of the choli on a band attached at the side seams and/or tacked to the choli front. But since there's so little holding the back and the back neck of the choli together, it's difficult for these cups to do their job, which is holding the breasts firmly in place while dancing. 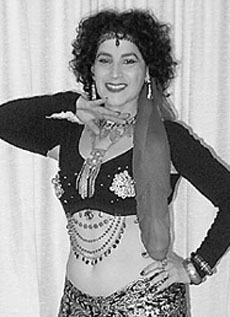 Some dancers cut the back out of their bra and replace it one or two sets of ribbons attached to the side of the bra, thus having both choli ties and bra ties visible in the back. That might work for you. You might decorate the back of the bra to look like part of the costume. Start with a bra that's black, or close to the choli color. Don't leave any spandex or hooks visible; cover the entire back with fabric, if necessary. (See "How To Cover A Bra.") Ornament it with shisha mirrors, coins, or beads to match the choli or coin bra in front. Cover the closure with a decorative pin or other ornament.